Philosopher meets Warrior: Crazy Monkey Defense emphasizes that learning martial arts is more than just learning to "fight." Crazy Monkey Defense teaches that effective martial arts does not have to be an either/or proposition - one can still train hard in a realistic setting, yet honour martial arts as an experience centred on a “Warrior Philosophy” of self-mastery, including discipline, honour, integrity, humility, respect, wisdom and compassion for others. 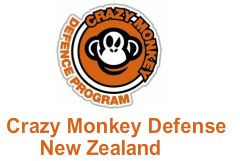 Being part of a tribe connected by shared values: Crazy Monkey Defense focuses on delivering a modern martial arts experience that emphasizes training in a community that is built on working positively with others, instead of been driven by egos and hyper-competitiveness. Encouraging people to be part of a martial art movement that is more than just learning how to 'fight', a movement that is positively changing peoples’ lives for the better, on and off the mat. Life performance coaching through martial arts: Crazy Monkey Defense encourages our clients to take the positive lessons learned in the gym into their lives and careers. 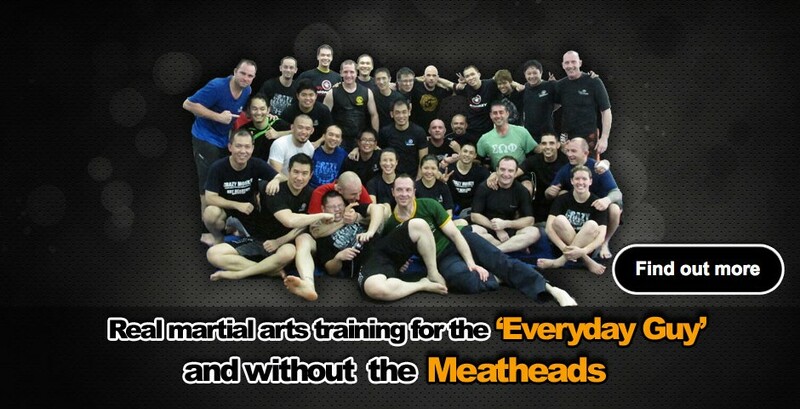 We focus on offering "a life-performance coaching experience through modern martial arts training." Functional martial arts for the “everyday” guy and girl: Crazy Monkey Defense offers an alternative to the hyper-competitive approach to experiencing modern martial arts - with a combination of membership sign-up filters and criteria, such as a "zero meathead" policy, "leave your ego at the door" campaign, focus on "fun, play and personal challenge," and driven by an ethic of "working with others, not against them." At the forefront of this approach is Crazy Monkey Defense for everyone. You don't have to be the alpha male or female, or put on the 'tough guise' to train or be great at Crazy Monkey Defense. If you are going to build a house that can withstand the elements, you need to build a strong foundation. The Crazy Monkey Defense Program consist of five primary "stand-up" courses or modules consisting of the Evolutionary Core (E-core), Kick Core, Combat Intelligence Athlete (CIA), Jurassic Core (J-core), and Spider Core (S-core). Our famous, market-leading grappling program Monkey Jits, underpin our "stand-up" program and encapsulates what we coach clients to become proficient martial artists. All our courses lead to certification, awarded on successful completion and demonstration of the necessary techniques and drills of each course. All courses are taught in a modular format and run between 12 to 24 weeks, except for Monkey Jits which takes longer. Our goal is to ensure that a client develops the correct habits while forming a foundational game. In Crazy Monkey Defense we don‘t believe that there is such a thing as an “advanced” technique or drill, rather what we do acknowledge are fundamentals done at a higher performance level. 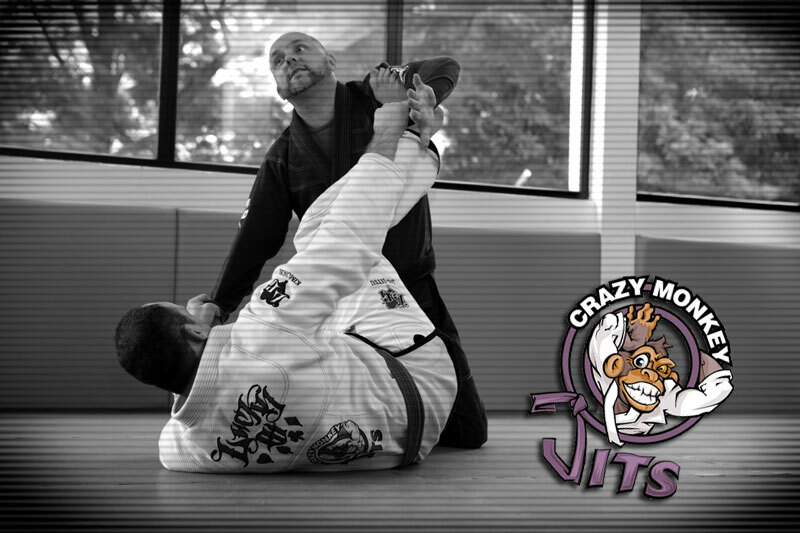 We introduce our clients during your training to key concepts that are exclusive to the Crazy Monkey Defense Program. What techniques work best and at what range. How to develop a ‘big picture‘ view of the fight‘ game. This is important to be able to perform in all areas, from stand up, to the clinch and the ground. Development of key embodied areas, unleashing the natural intelligence of your body, so you can develop formidable technique, backed by power, speed and timing. 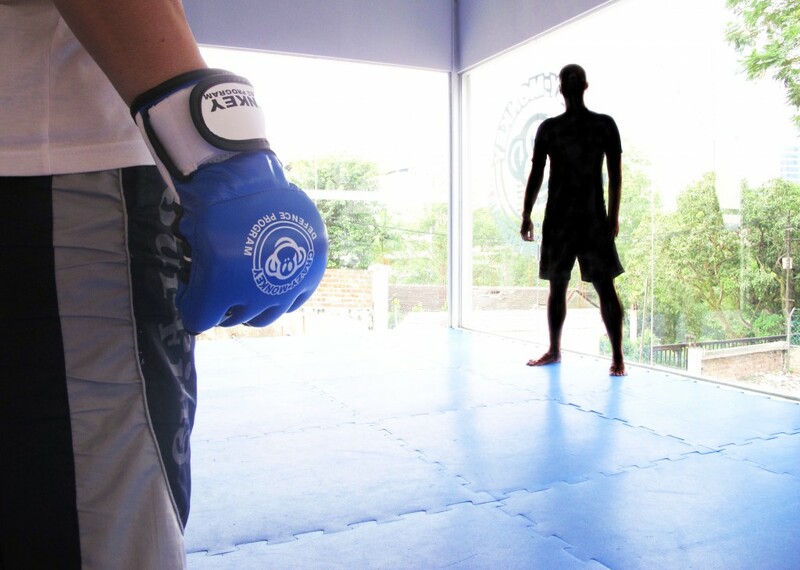 A key element of our training is a focus on what your body is designed to do in a fight. Many martial arts teach what their style will do, even though those very same movement patterns are not evolutionary designed for survival. Simply we teach you how to work with evolution not against it. During our courses we help all our clients focus on taking the lessons from the mat, so that they can perform at their best in their life and career. Unique to ALL Crazy Monkey Defense courses are techniques, drills and strategies that are specifically designed to ‘plug‘ into a person‘s inherent evolutionary adaptations to surviving a real physical threat. We call this "Evolutionary Defense Technology" (EDT). Unlike many martial art systems, Crazy Monkey Defense works with a person‘s evolutionary response to danger not against it. We have designed a physical martial art expression that is built off a person‘s first response and instinctive reactions to danger. Bottom line - we enhance and train what is already inherent in all human beings when it comes to surviving a fight. Known as the ‘E-CORE’ by Crazy Monkey Defense Trainers, this program is the first course you are introduced to. In this course, we lay the foundational skills necessary for all future Crazy Monkey Defense training to take place. In a nutshell, the ‘E-CORE’ is a fast track way to give you important and fundamental stand-up skills and knowledge within a relatively short period of time. The Crazy Monkey Defense ‘Kick-CORE’ will be covered straight after the ‘E-CORE’ completion. This will teach you the most basic, but functional kicks for both sparring and self-preservation. The focus is on low line kicks, that don‘t take a whole lot of ‘flight time‘ to perfect and also do not require a great level of flexibly. Self-preservation training that works with evolution not against it, and focussed on training your Evolutionary Survival Responses in a fight. These are responses that were built over thousands of years of human evolution. All we do is re-awaken this knowledge in YOU…The Combat Intelligent Athlete Program (CIA) is the self-preservation training aspect of the Crazy Monkey Defense Program and built of our unique teaching framework. In CIA we build your skill to handle survival stress against a physical assault, quickly, systematically, with progressive resistance and we do this with our proven and safe methods. In CIA we focus on keeping everything simple, with a focus on gross motor movements wherever possible, and ALWAYS take into account how your body will respond in a real fight. When you have successfully completed the ‘E-CORE‘, ‘Kick-CORE‘ and CIA courses, you will then move onto the Jurassic Core program. The ‘J-CORE‘ program will take your game to a whole new level. While the E-CORE‘ focused on keeping distance and attacking from there, the ‘J-CORE‘ is all about taking the fight to the opponent and operating in the midline. In this program you will develop the confidence to breach the attacker‘s incoming strikes and working counterstrikes. Once the J-CORE‘ is completed, you will move on to the Spider CORE (our famous clinch program) and Crazy Monkey Defense‘ signature clinch game the ‘Straight-Jacket’ game. The ‘Straight-Jacket’ game is unique to Crazy Monkey Defense, where we actively and progressively teach the clinch for striking, often referred to as ‘dirty boxing‘- which will give you a unique advantage in your game. 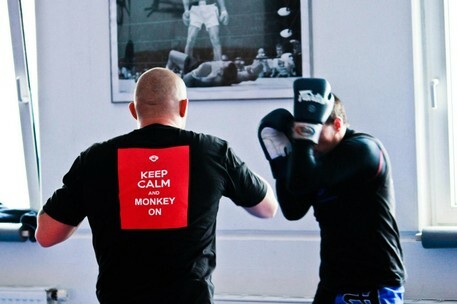 Monkey Jits focuses on coaching ground skills that translate to self-preservation. With Monkey Jits, equal time is spent on learning to apply ground or grappling skills against opponents who strike on the ground, and from this perspective, Monkey Jits players need not only know how to successfully apply their grappling skills against aggressive striking opponents, but must be equally versed in how to combine grappling and striking to their advantage. Thirdly, Monkey Jits is centred on the enjoyment of the game and in this sense, the objective of Monkey Jits’s training, while focussed on its use in self-preservation, is equally focussed on having fun. Enjoyment of the game implies that training in Monkey Jits, while being challenging is not centred on competitive success. A player in Monkey Jits, rather than focussing on winning, or measuring performance based on who he or she can submit, focuses instead on developing psychological and emotional skills sets that beyond the mat and positively into their life and career. This philosophy of Monkey Jits brings it in line with the philosophy of Crazy Monkey Defense as it umbrella organisation. Playing the game, as in 'free-rolling' of various kinds also acts as a way to maintain the necessary attributes (such as timing, fitness, strength and mental tenacity) to effectively apply grappling skills in self preservation if required. Rodney King, a 3rd Degree Black Belt under world renowned BJJ Master Rigan Machado, has developed a BJJ based program, entitled Monkey Jits, that focuses on developing somatic health, wellness and fitness. You will not find people in our program trying to show everyone how tough or good they are or getting off on dominating and beating people on the mat. Monkey Jits classes are still performance based, we roll and we still train for self-defense. More importantly though our Monkey Jits classes are about playfulness, exuberance and first and foremost about having a great time whilst really learning something positive about yourself and your body. Monkey Jits is a fantastic whole body workout.